Not surprisingly, the Palestinians, including PA President Mahmoud Abbas disapprove of this idea. But they do so in lukewarm terms, not wanting to offend Kerry, with the hope that when the April deadline for the current round of talks rolls around that the Palestinian side will not, as it was in 2000, be portrayed as the party who refused peace. Still, as former US President Jimmy Carter once told me, a continued Israeli presence in the Jordan Valley is unacceptable to the Palestinians. Indeed, it is impossible to say that an occupation has ended when the occupying army is still there. That should be obvious. But that’s apparently not the case for Kerry and President Barack Obama. There should be no confusion on this point: however much the US administration has shifted its Mideast position regarding Iran and the broader Arab world, nothing has changed with regard to the occupation. The friction between Israeli Prime Minister Benjamin Netanyahu and the Obama administration can obscure this reality, but a lot of that friction is based on Netanyahu’s frustration that the United States will not follow his regional designs. With regard to the Palestinians, the rhetoric may be different, but the actions of both Israel and the United States on the ground in the real world are little different than they have been for twenty years. The Jordan Valley issue has been a known point of contention all along. Kerry and Obama have insisted that matters like this one can be worked out, but Kerry’s proposed solution is simply the Israeli position rehashed. Netanyahu objects to Kerry’s proposal simply because he wants the Jordan Valley to be part of Israel in any final agreement. That is not workable, but a long term Israeli presence that can easily be extended — all that has to happen is the Palestinians need to be declared “not ready” at the end of ten years — effectively accomplishes the same thing, with Israel still controlling the territory, although they might not be able to build more settlements there for some time. Palestinian forces have already been trained by the US, and even Israel agrees that has worked well, so this insistence on more training is absurd. But the real problem here is more fundamental and points to exactly how we will know that the United States is serious about brokering a permanent agreement between Israel and the Palestinians, if they can ever reach that stage. As many critics of US policy in Israel-Palestine and the role of the Israel lobby in creating that policy have pointed out, a US President is capable of taking on the lobby and winning, but it involves a big political fight and expending a lot of political capital. This has happened in recent weeks with regard to Iran — the Lobby has backed off. When an administration wants to fight that battle for resolving the issue of the occupation, it will do so by changing the terms of the discussion. Right now, as it has been for decades, the occupation is approached in Washington as a security issue for Israel. In reality, Israel is the regional superpower, both militarily and economically, while the Palestinians have no way at all to defend themselves. When the occupation is the priority and is treated as intolerable, then the discourse can be centered around security for all within the framework of ending the occupation rather than being a security issue within which perhaps there is some way to end the occupation. Obama and Kerry probably know this, and have chosen to work within the existing framework and just do the best they can under those conditions. They must also know that this approach will likely fail, but the very effort will augment their efforts regarding Iran and the general reorientation away from involvement in any of the other current and brewing conflicts in the region. The reason the United States will not engage in that political battle touches on the myths that are so often heard about the Israel-Palestine conflict; particularly the one that tells us that resolving that conflict is a “US national security interest.” That is somewhat true, but it is a far less urgent concern than ratcheting down the conflict with Iran, for instance, or extricating the United States from the regional conflicts that our other “dear friend” Saudi Arabia is so intimately involved in. Both the rapprochement with Iran and broader regional shifts offer clear benefits to the United States. In the wake of the Iraq debacle, they go a long way to ensure that such an enormous expense in blood, capital, and regional stability doesn’t happen again. They also help boost the potential for US engagement in trade and diplomacy throughout the region — engagement with Iran is a huge boon toward that goal while staying away from regional conflicts. Continuing to work with whomever is in power also allows the United States to protect future relationships with these states, rather than with only the current regimes. Threats by the Saudis to shift their business to Russia or China are empty. Neither of those countries have anything more than the smallest fraction of money and military assistance the US can and will continue to offer. So, yes, this issue could be addressed, but it’s a lot less potentially beneficial than the positive results of other policy shifts Obama is pursuing, and it would entail a considerably bigger political battle. So, it’s not going to happen. Indeed, the Palestinian issue is probably being pushed now by Washington in order to manufacture a payoff to Netanyahu for his acquiescence to real US priorities. The path to resolving the Israel-Palestine conflict has been clear for some time. 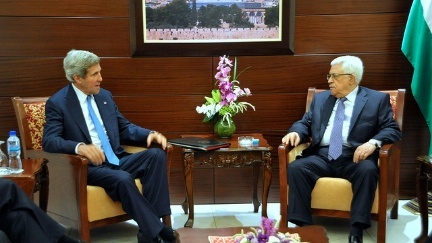 The Palestinians need to abandon their dependence on the United States, which will not ever deliver the goods. They need to pursue an international strategy that creates real political pressure on Israel. The ground is fertile — Israel’s obvious unwillingness to abandon the key territories on the West Bank, well beyond the major settlement blocs, and its refusal this past weekend to permit Holland to provide an electronic scanner that would have allowed Palestinians in Gaza to export goods without putting Israeli security at risk have exposed the hollowness of Israel’s security arguments. Israel’s actions are not about security, but about power, and this fact is something the Palestinians and their supporters around the world can exploit. It can also be used by true friends of Israel who recognize that Israel’s security is at risk not because of Iranian threats that never existed (see Juan Cole’s excellent explanation of that here) or some small bands of Palestinian militants, but by Israel’s continued refusal to compromise. Europe seems to be taking some steps toward reorienting the politics around the occupation to create the incentives Israel needs to change its policies. The Palestinians need to follow their lead, as do the many supporters of a just peace throughout the world, including in Israel. Waiting for the US to deliver the goods is more futile than waiting for the Messiah.